The phrase “think happy thoughts” took on a whole new meaning when Ben was struggling with ALS and I was struggling with caregiving. ALS is known to be a very isolating disease. I’m sure that even when he was not literally alone, Ben felt isolated. I felt so helpless when Ben hurt because sometimes, it was so hard to speak to explain himself and be understood, that he just shook his head and stopped trying. Also, with every day came the dread of what ability he would lose. Sometimes he simply had a bad day and other times there was an obvious change in his health. There were days when I was able to care for him without any problems, but then there were the days when it was exhausting and overwhelming, and if I was having back issues, it was physically painful. We cannot walk in the shoes of our loved ones, we can only love them. Love is a lot. Thinking happy thoughts is a lot, too, because, along with love, it lets us remember who we were and what was important before illness changed things. For us, happy thoughts almost always included memories of our visits to Walt Disney World. Ben spent so much time every day looking at the videos and photos from our visits to Walt Disney World. We loved to listen to the music from the parks, too. He went on their vacation planning web site to plan fantasy trips. I liked to see him planning because I felt it kept his head in living and focusing on what he could do. I truly believe that helped him manage the disease pretty well for about four years. On those very difficult days when eating was a challenge, or there was a fall, or some other accident, or even just a lack of energy to transfer or be transferred, we had to remember, “All you need is faith, trust and a little pixie dust!” So much happens with illnesses and caregiving that is unpredictable and beyond our control. For me to maintain a certain state of calm that allowed me to be a problem solver, I needed to have faith and trust that things would ultimately be okay. 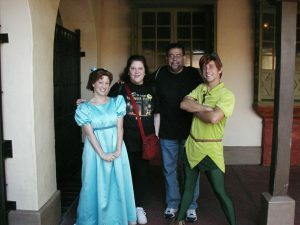 The pixie dust was the whimsy that always let my inner child thrive in the midst of very grown-up, complex circumstances. Sometimes it was just a loving moment between Ben and me that would make us laugh. Sometimes it came from friends, sometimes it came from caring strangers, and sometimes it came from both of us taking a moment to remember the good and loving times. And, with faith, trust and pixie dust, we even made it back to Walt Disney World four times during his illness. I named my blog Pixie Dust For Caregivers because quotes like this, as well as many Disney characters, films, lyrics and attractions from the Parks were the pixie dust that gave me perspective, inspiration, and comfort during the caregiving years and now, as I work through grief. They helped Ben, too. At times, they simply gave us much needed entertainment. After a respiratory crisis, Ben landed in the hospital, and life with a tracheostomy and feeding tube was not going well, including infections and pneumonia. After six weeks, Ben chose to go to the hospital’s palliative care unit. It was painful beyond words to know that Ben was miserable. Tragically, ALS was not going away. He was not going to get better. But, to know that he had only days left in this world was devastating. At the same time, there was a certain relief that he would be free from the physical and emotional pain and constraints of the disease that rendered him unable to breathe on his own, speak, eat, walk, use the computer or play his instruments- things he loved. A line in the song “You Can Fly,” is, “Think of all the joy you’ll find when you leave the world behind and bid your cares goodbye.” I wanted Ben to have peace and to feel comfort he had not felt in the nearly six years he bravely battled ALS. Peter Pan said, “To die would be an awfully big adventure.” I don’t know that I would call ALS an adventure, but it was a journey. A very difficult journey that Ben navigated with much bravery. Now, I put faith, trust and pixie dust in the belief that Ben has “bid his cares goodbye” and he is in a peaceful place where he can walk and run and eat and talk and sing and use his hands to use the computer and play his instruments. That gives me peace.